2017 – Enterprise Collaborative Action Grant – Enterprise Community Partners: For community programming at the People Spot, Fall 2017, in Albany Park. 2017 – City of Chicago Year of Public Art – 50×50 Neighborhood Arts Project: For Territory Urban Design Team to build a People Spot, a semi permanent seating area sited at the intersection of Spaulding and Lawrence, designed to bring together the diverse communities of Albany Park. 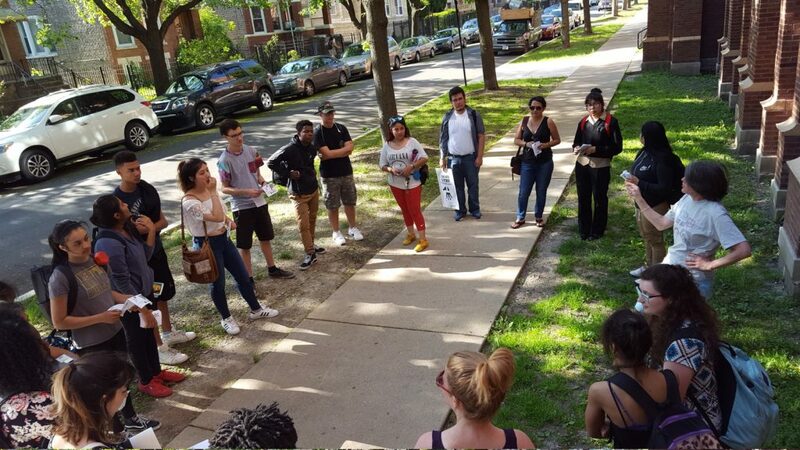 2017 – Open Engagement: Justice – Conference presenter, “Walk in Our Shoes,” Youth Empowerment Walking Tour of Albany Park, curated by our team featuring public spaces that accommodate young people. 2016 – SXSW Eco Place by Design: Winning Pitch in the EQUITY + INCLUSION category, Austin, TX. 2016 – Chicago Community Trust – Acting Up Award: For Territory Urban Design Team to create colorful pop-up placemaking sites for the diverse communities of Albany Park to meet and interact. 2016 – Tiny Home Summit to address youth homelessness in Chicago: Session on youth voice featuring Territory’s design team members. 2015 – Association of Architecture Organizations Annual Conference: “From Kid to Student to Architect: Connecting the Dots Along the Learning Pathway” – Presenter Helen Slade, Director Territory. 2015 – Chicago Community Trust – Hive Chicago Fund For Connected Learning: “Think, Make, Share,” a six week teen-led hands-on workshop and design slam for LearnxDesign, an international design educators conference. 2015 – Chicago Artists Month: “Featured Artist, Territory Urban Design Team” – See Outreach Projects for details. Awarded by Chicago Department of Cultural Affairs and Special Events. Affiliate Program Partner of the Chicago Architecture Biennial. 2015 – Structures for Inclusion, 15th Annual Conference: “Best Program/Practice” Panel – Presenter, Helen Slade, Director Territory. 2013 – Spontaneous Interventions: Design Actions for the Common Good: Juried exhibition at the Chicago Cultural Center – Featuring the work of Territory Urban Design Team from the summer of 2012.